There was only one possible outcome. 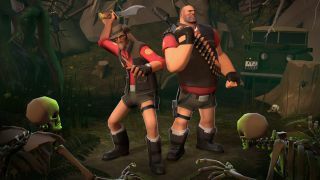 "You might remember we specifically told you not to make Heavy short shorts," wrote the TF2 team last night. "However, once we actually glimpsed the majesty of Heavy short shorts, we saw the error of our ways." In addition to the Jungle Booty, other winning items include the Crown of the Old Kingdom hat and the Tomb Readers sunglasses. All items are now available to those who pre-order Temple of Osiris, and will eventually make their way to the MannCo store along with an additional three runner-up items.